Affordable Roofing offers gutters and gutter guard solutions for your home! 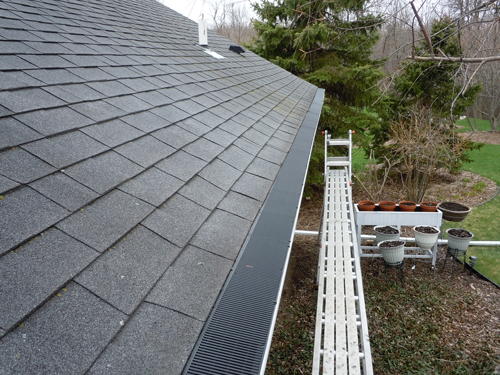 Your gutters are an important part of your home. In Milwaukee and Waukesha counties the soil conditions are poor, requiring a high quality gutter system to move water away from your foundation. We use .032 seamless aluminum gutters in either 5″ or 6″ sizes to help move water to where you need it moved. Affordable Roofing's gutters are formed on your site and are hand mitered for the best quality job. Affordable Roofing can size your home to give the proper size gutter and down spout to best fit your needs. Affordable Roofing also water tests gutters to insure proper pitch is achieved. All miters and caps are sealed with the best quality sealants and fastened using only screws. Gutter protection solutions are available in all makes and models to fit your needs and budget. The good old days of climbing ladders in spring and fall are over. We can offer many different styles of gutter guards to keep your gutters clean. Not every home or building in our area is the same nor is every tree. Many gutter guards pre-form better for different styles of trees and debris that fall on your home. Affordable Roofing will come out and inspect your home for the best gutter guard that fits your needs. We offer a vast array of gutter guard solutions to provide optimum protection for your home. Interested in rain barrel installation? Capture rainwater from your roof and use it later when it’s dry outside to water gardens, flowers and other shrubbery. Rain barrels help keep excess water out of the sewer system when it rains (or when snow melts) and prevents rain from becoming polluted stormwater runoff. Rain barrels, underground drains and rain chains are available for install. "Thank you for the good job on the garage roof! We are very pleased and it looks great, you also did such a wonderful clean up job."